Femtosecond laser direct writing is a promising technology for the fabrication of photonic integrated chips mainly due to its intrinsic capability of three-dimensional (3-D) prototyping in transparent substrates. Currently, the difficulty in inducing large refractive index changes smoothly distributed in the laser-irradiated regions is the major obstacle for producing compact photonic integrated circuits (PICs). 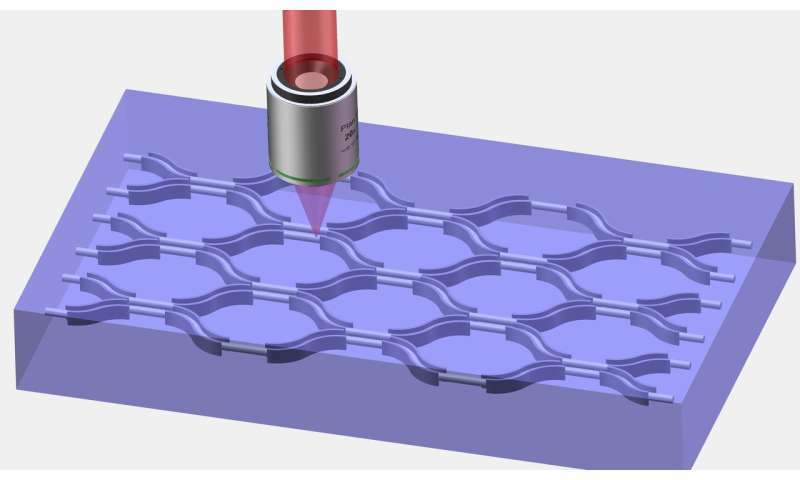 Recently, researchers in China proposed a solution to suppress the bend loss of the waveguide at small radii of curvatures by more than one order of magnitude, opening a new avenue to downsizing of 3-D photonic integrated circuits. Their work, titled "Suppression of bend loss in writing of three-dimensional optical waveguides with femtosecond laser pulses," was published in Science China Physics, Mechanics & Astronomy. PICs manufactured by mature photolithographic technologies are used in sensing, optical communications, optical signal processing and biophotonics. As an intrinsically planar fabrication technology, increasing the integration density in the photolithography mainly depends on reducing the sizes of individual components. Alternatively, PICs of geometrically complex 3-D configurations can now be fabricated using femtosecond laser direct writing, which potentially provides high integration density and extreme flexibility in terms of integrated multifunctional systems such as optofluidics and optomechanics. Currently, waveguides inscribed in fused silica glass have been demonstrated to support single-mode transmission with propagation losses as low as 0.1 dB/cm at 1550 nm wavelength. However, the typical refractive index increase induced in fused silica by femtosecond laser irradiation is on the order of ~10-4-~10-3, giving rise to large bending losses at small radii of curvatures. This has become a major obstacle for producing compact photonic devices with the 3-D waveguides written by femtosecond laser pulses. To solve this challenging problem, the researchers inscribed multiple modification tracks in fused silica by femtosecond laser direct writing, arranged into two arrays to form a pair of vertical modification walls on the two sides of the curved waveguide. The modification structures produce a strong localized densification of the material, as well as significantly enhanced structural stress in the guiding region. As a result, the refractive index contrast of at the waveguide bend was substantially increased. By optimizing the geometrical parameters of the bend-loss-suppression walls (BLSWs), they successfully reduced the bend loss of curved waveguides with a bending radius of 15 mm from ~3 dB to ~0.3 dB.